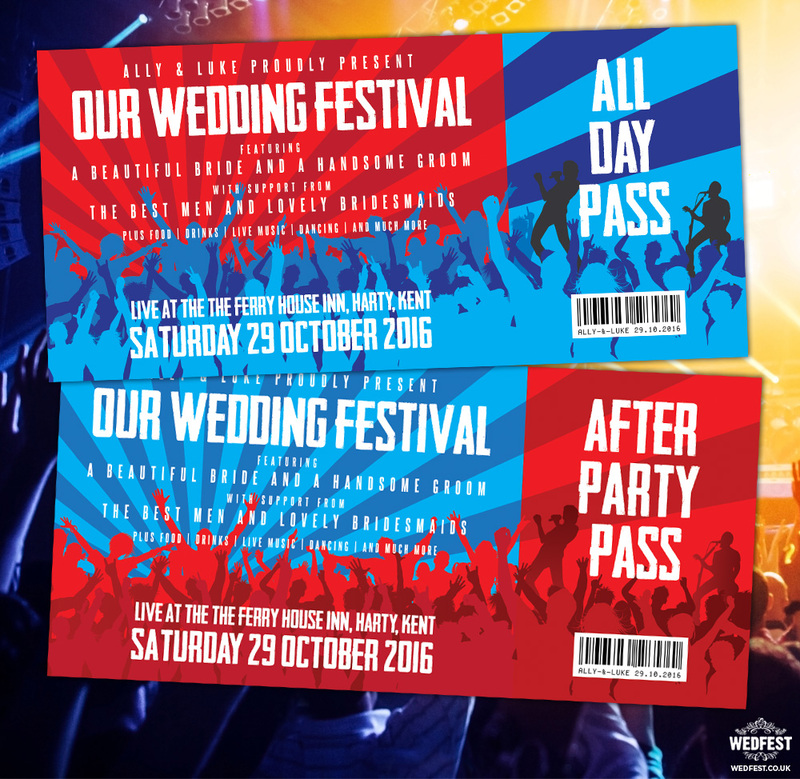 Fans of Wedfest will know that we love getting up to our eyeballs in all things fun – it’s our way of discovering the best and most unusual ways to help you add unexpected twists to your wedding day. 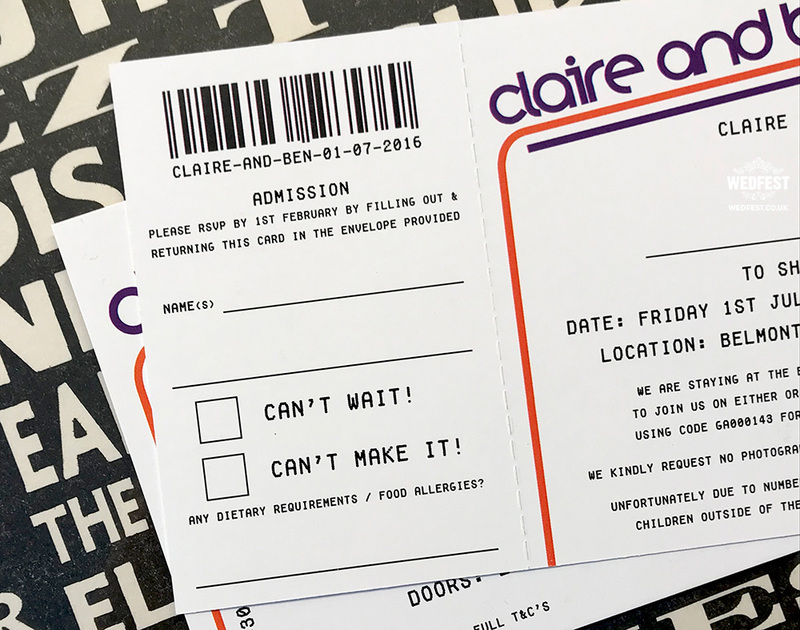 When festival season is over and done with, you can often find us crowdsurfing – all in the name of research, of course – around some of the biggest, baddest venues in town, which is where we had a lightbulb moment and decided to create our knock-your-socks-off, good-as-the-real-thing concert ticket wedding invitations. 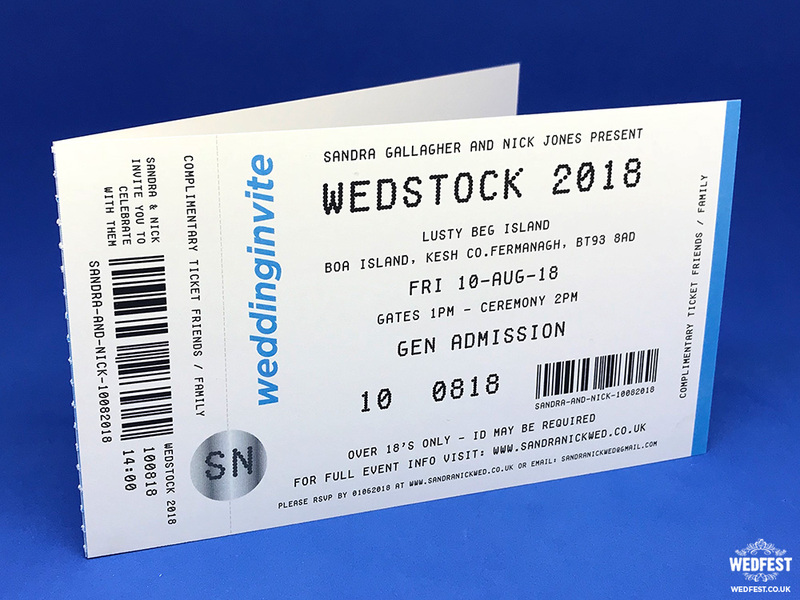 For our besotted brides and giddy grooms, having a wedding theme with relevance is a big deal, and many of our wonderful customers met at concerts, went to gigs on their first dates, or simply found a connection through music, making our ticket invitations a perfect link to their big day. 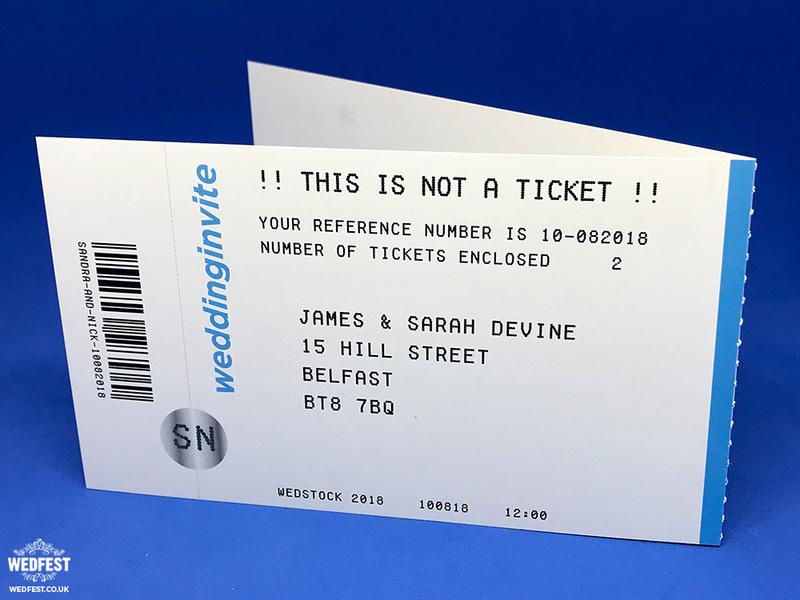 As ever, our concert ticket wedding invites are modelled with close scrutiny against the real deal, and we’re especially proud of how convincing our attention to detail is. 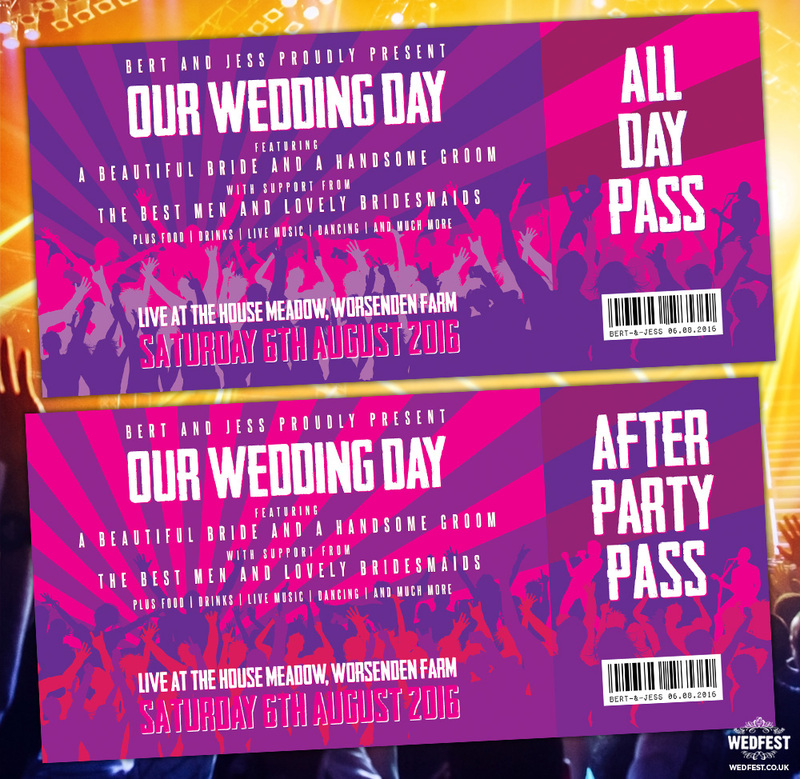 The event information is transformed into the details around your big day… with you as the headline act, of course! 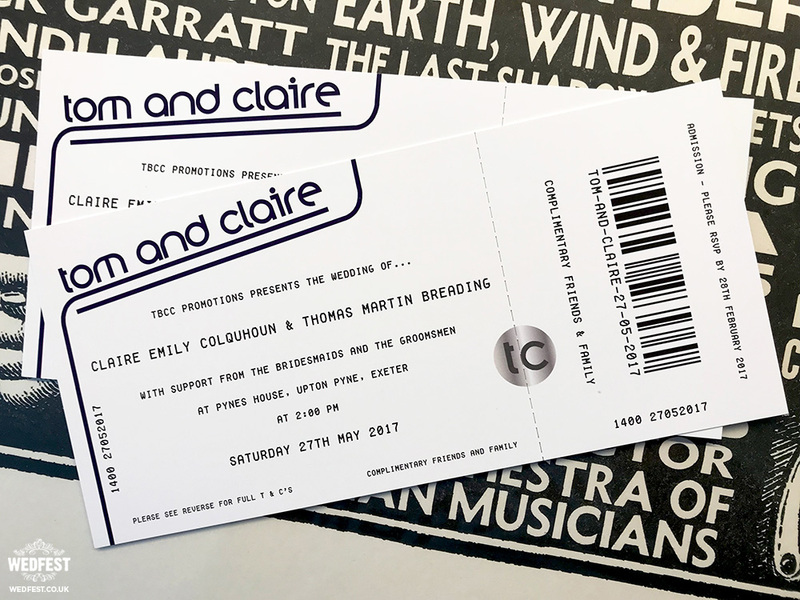 Even the barcodes are customised, with tear-off slips used as the RSVP for your guests to say a resounding yes to the gig of the year! 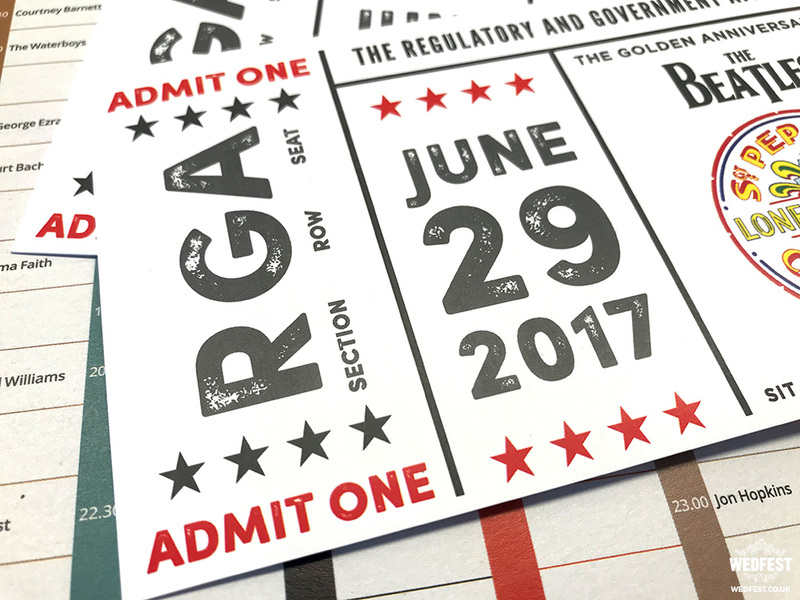 They look and feel just like the tickets you would have received from ticketmaster or your favourite live venue. 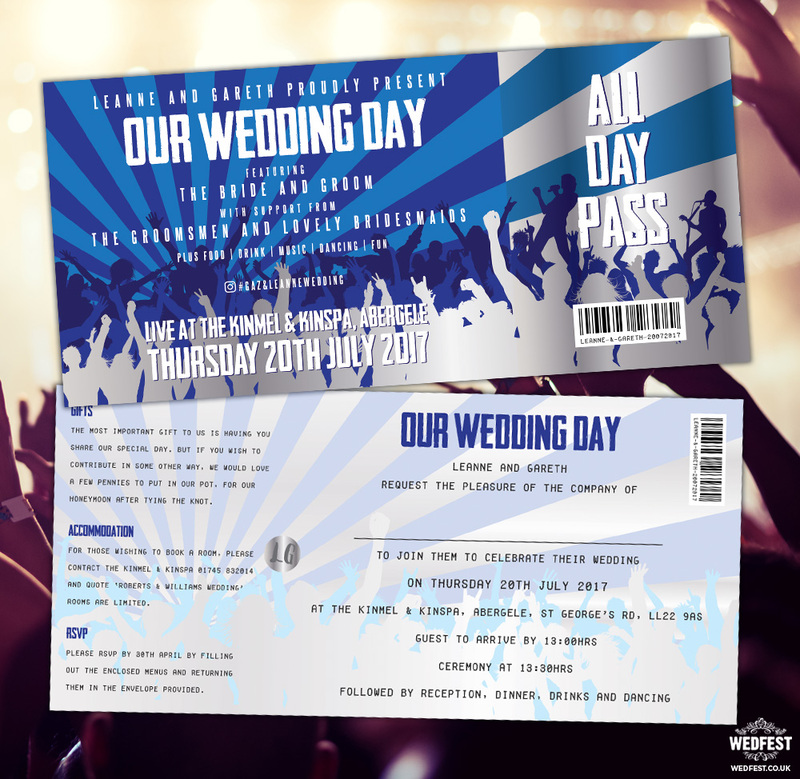 As with all of our wedding stationery, we thought long and hard about how to tie our concert and gig ticket wedding invitations in with the rest of your nuptials to create a well-rounded theme. 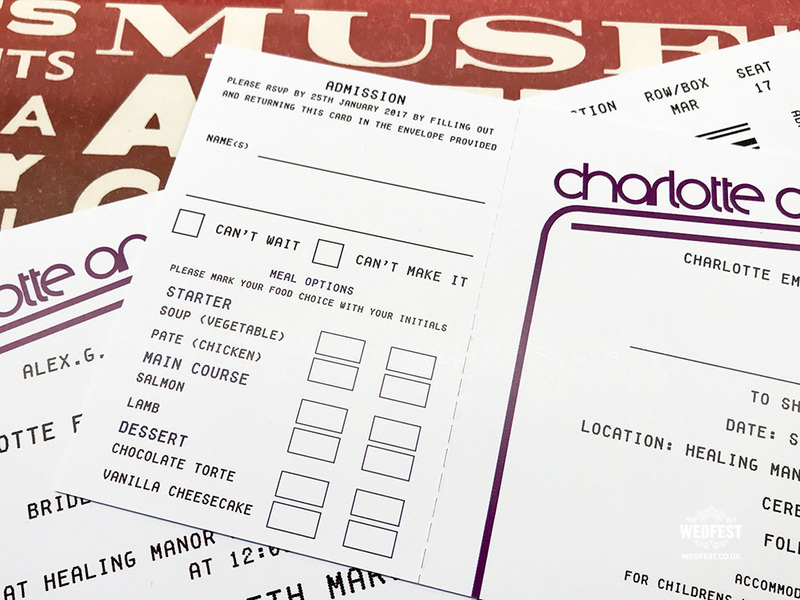 We developed a range of matching table plans, fully customisable to your event. 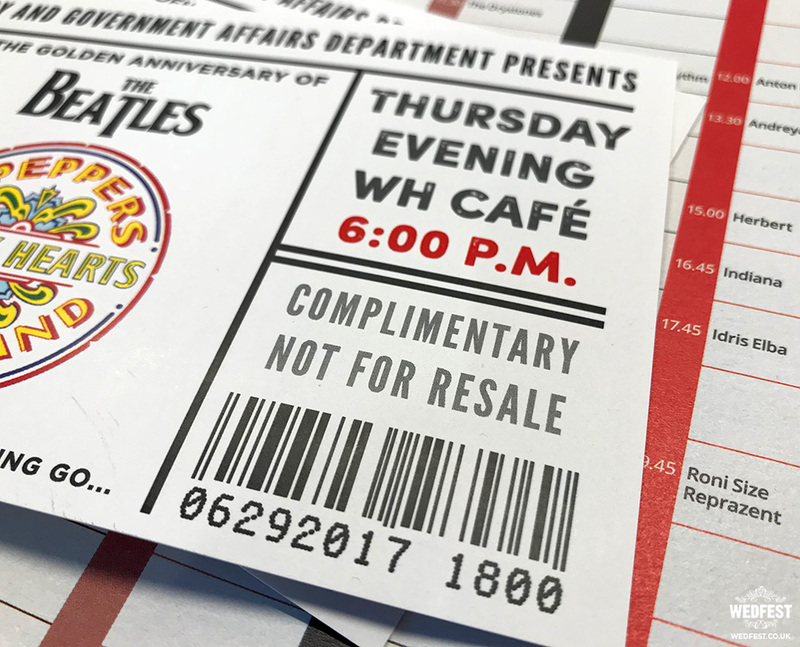 Some of our music-mad couples have named their tables after different bands they’ve seen and tickets they’ve lovingly kept, and some have opted for different venue names to truly explore the concert theme. 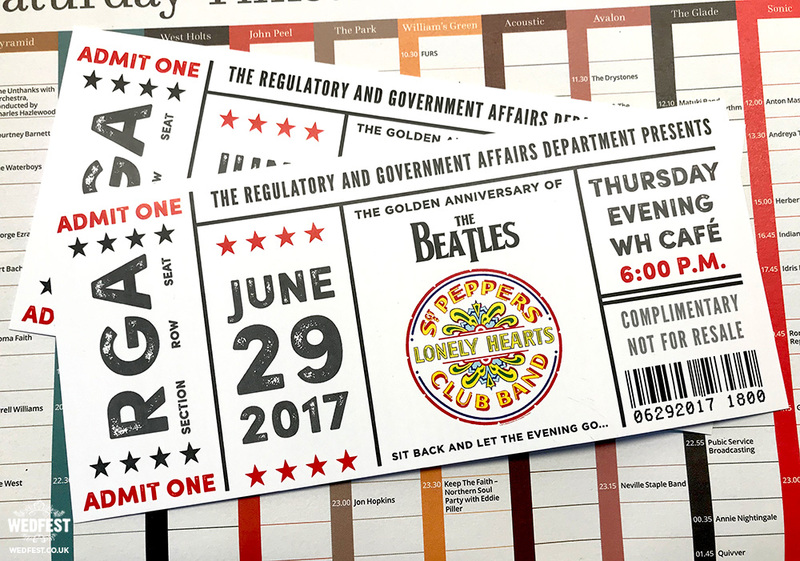 We’re open to any and all suggestions, and it’s our pleasure to work with you to create a day that’s unique to you. 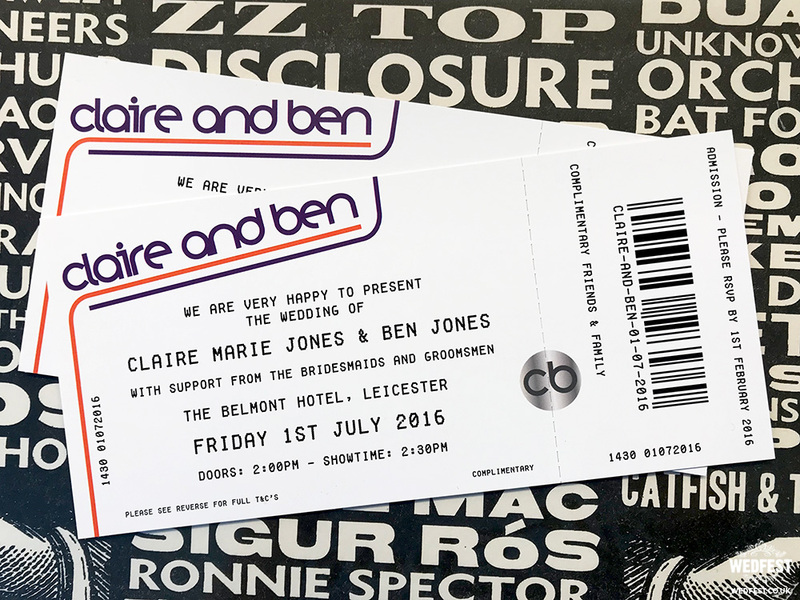 As well as table plans, we’re almost A-list-level famous for our coveted gig wristbands, which can be given alongside your invitations for guests to wear at your wedding. 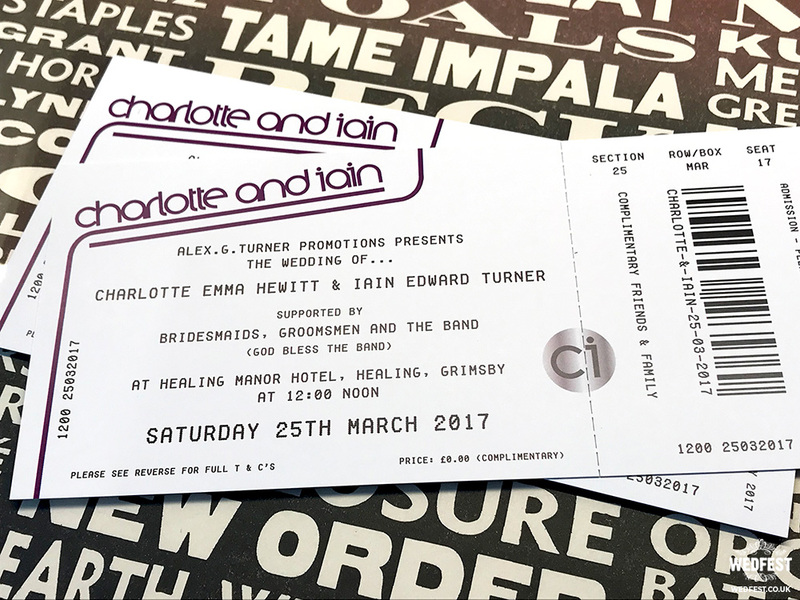 These can be customised with your names, surname (instead of band name), or even venue to add that special extra to your big day. We can gladly match to your colour scheme, too! 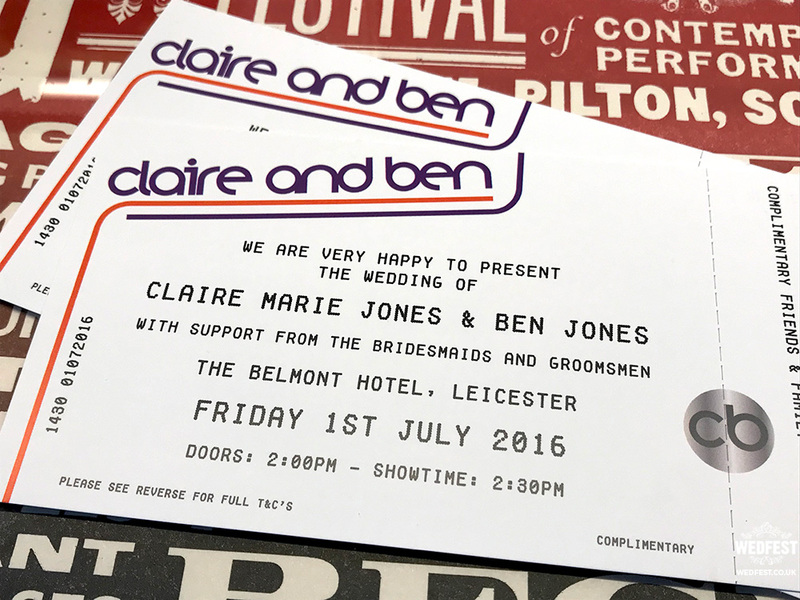 Not only do our gig themed extras make for beautiful additions to your theme, they’re also the perfect keepsake for you and your guests. 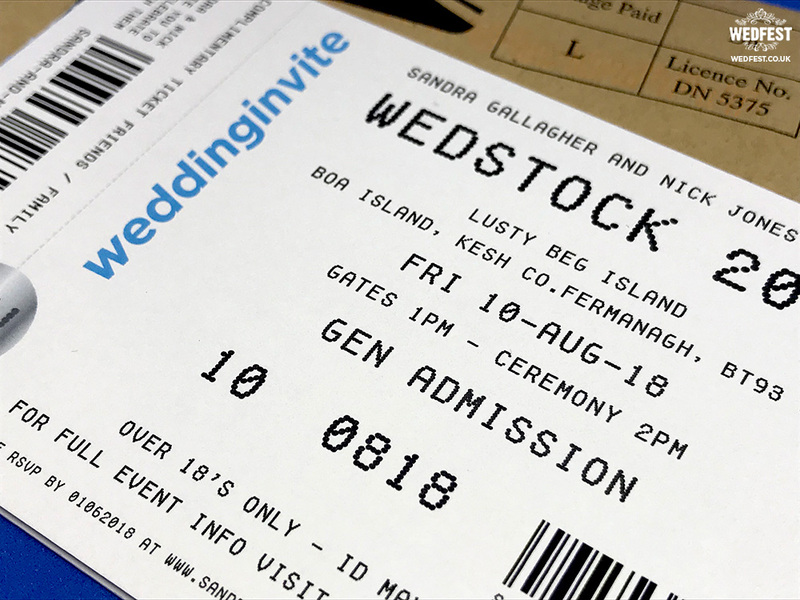 It gives us huge pleasure to hear time and time again from our lovely brides and grooms how their friends and family still talk about their wedding as though it really was the event of a lifetime! 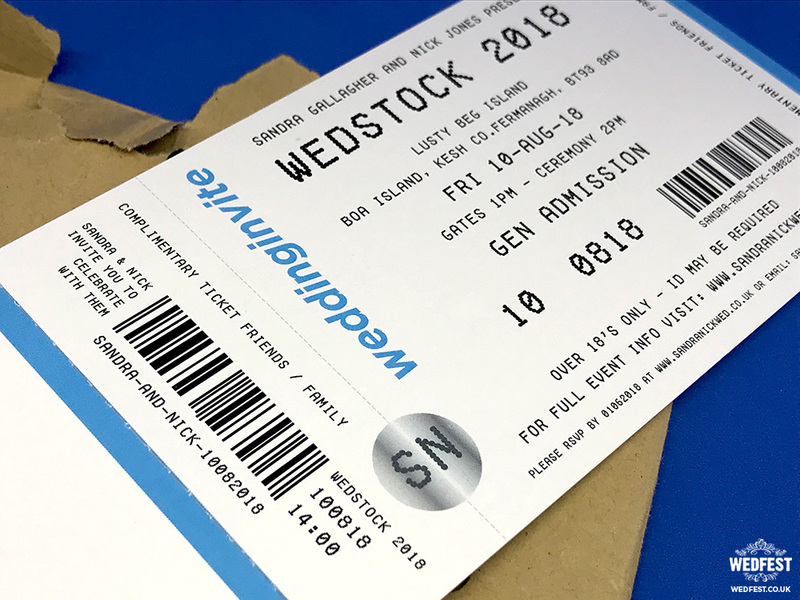 If you’d like us to help you rock centre stage and make some awesome ticket invitations for your big day, then please click here to get your show on the road.